I remember the night well earlier this year when United Airlines placed me as #11 on the overbooked list at SFO on a return flight to Eugene from Fresno. As the Gate Agent announced the last flight of the night to Eugene was overbooked, I knew I had a seat since I had just arrived on one of their planes moments earlier. But just to be safe, I asked and that's when I found out me and 10 other idiots had been duped...sold a raw deal by the "friendly" skies. After my initial anger, I retreated a moment and tried to make lemonade from the bushels of lemons. O.K., no big deal, hang out in a free airport hotel (actually a quite nice one too), eat a honkin' big free meal at the airport food court and get a free ticket to...OSHKOSH! I reasoned that IF the free ticket could only be used by me to return to the biggest, baddest, most important airshow, fly-in and trade show in the country, then it would all be worth an RON (remain overnight) at SFO. So this week, I have begun nailing down that trip back to the land of Cheese, endless airplanes and Brats cooked on the World's Largest Grill®. I snagged a dorm room at the University of Wisconsin, and at $50 a night, who cares if it doesn't have A/C? Besides, living in the dorm, I can get to all those keggers and enjoy a whole mess of other fratboy nonsense. Or not. I consider the acquisition of accommodations to be a huge development in my quest to get back to Oshkosh again, because real hotel rooms are impossible to find any closer then Green Bay during the show, even this far out. Sure, who wouldn't want to stay at a big, swanky hotel on the field and run into Phil Boyer or Alan Klapmeier in the lounge? But (a) those hotels jack their prices into orbit during the EAA show, and (b) mere mortals like me have zero chance of ever nailing down one of those prized rooms. More [much more] on this trip as the event gets closer. I am just glowing today with this news. 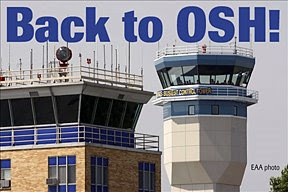 If you are not an aviator, or are one but has never been to Oshkosh, you have no idea what you are missing, or how important any trip back there is to a guy like me. It is sort of a cross between a religious pilgrimage to Mecca and a romantic getaway to sneak off with 10,000 of your sexiest mechanical girlfriends, the kind that FLY. Again, if you're not ME, I guess that last sentence might just sound a little weird. But if you have been lucky enough to make the EAA show before, then I can almost hear you shouting "AMEN, BROTHER!" right about now. UPDATE@613P on 11.19.08: O.K., I have just returned from the Eugene Airport where I redeemed my United voucher for my FREE ticket to Oshkosh. After a simple process, I was handed a R/T reservation into Appleton worth $611.49. Add to that the estimated $100 for the free hotel + $25 (dinner and breakfast) in free airport food and you get $736.49 in goodies...all because UAL can't figure out how to cram 81 souls into a regional airliner that has 70 seats. They also had to find rooms, meals and free tickets for 10 other pax that night...go ahead, add that up. If anyone at any of America's best business schools can tell me how the hell this overbooking garbage pencils out for the airline, I am willing to listen.